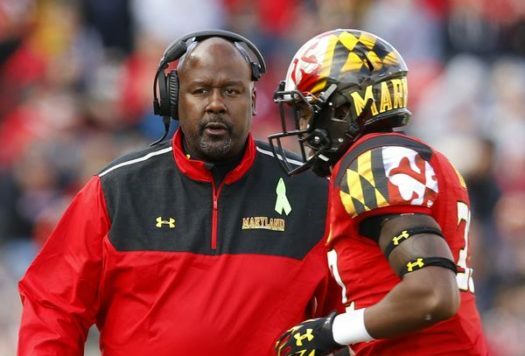 Former Alabama University Offensive Coordinator Mike Locksley has brought his talents back home and is now the head football coach for the University of Maryland Terps. Locksley is a Maryland native who played for Towson University. He began his coaching career at the University of New Mexico, and then spent one season at Maryland after being let go from New Mexico for a pretty rough season. After coaching at Alabama for roughly three seasons, Locksley has returned as the head coach at UMD. Locksley has a coaching record of 3-31 and is hoping to change that this upcoming season. Two athletes who will contribute to the team are incoming freshmen Nick Cross and Izaiah Hazel, both four-star athletes coming from very well-known schools in PG County. Cross will be graduating from DeMatha Catholic High School and Hazel from Dr.Henry A Wise High School this spring. Both athletes have one thing in common: they decommitted from their respective universities to stay home and play for Maryland. Coach Locksley might have something to do with that. Cross decommitted from Florida State to play for Maryland. Cross had a total of 34 offers, many of them being top schools in the nation for football. He is the 7th best safety in the country and the 126th best player in the country. Likewise, Hazel decommitted from West Virginia to commit to Maryland. He received a total of 15 offers. Hazel is the 25th best wide receiver in the country and the 180th best player in the country. To be recruited in the first place can be a challenge for many players. “Universities look at your GPA, SAT score, and your highlight tape,” said senior Ta’Ron Hewan, Parkdale’s starting quarterback. Even after colleges select players, it is up to them to then select the school. This process isn’t an easy one, either. Although both Cross and Hazel had already committed, they both made decisions that will change the rest of their careers as football players. It will not only affect them but the minds of upcoming seniors and their decisions on where to play football. Only time will tell whether that decision was made in vain or not.